i’m not a big fan of racing games, but i like to pick them up on occasion. i was interested in checking out the wave race series, but when it comes to series i like to start at the beginning … the very beginning. with the soulcalibur series i started with the lesser-known soul blade instead of its much better-known dreamcast sequel, and similarly with wave race i ignored the classic wave race 64 in favor of its game boy predecessor, simply titled wave race. retrogamer.net has a good rundown of the game. just based on a description one could easily wonder what the appeal of the original wave race is. you and your three competing jet-ski riders are indistinguishable save for the number hovering over your figure indicating your current position. the water mechanics make it feel like you’re almost constantly sliding all over the place, and on the hardest levels it’s easy to spin out of control. as with many racers, memorization is key and making a single serious mistake can often completely ruin your chances of winning. to add to all of this is the painful fact that each higher difficulty level adds to the number of courses and laps you have to play through: at the 550 cc level you have four courses with two laps each; at the 650 cc level you have 6 courses with three laps each; and at the 800 cc level you’re faced with a marathon comprised of a whopping 8 courses with 4 laps each. 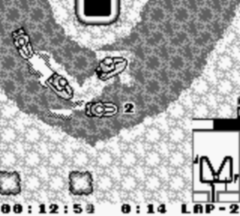 the game also features some decidedly questionable opponent AI (described in this random forum post aptly titled “*** you Wave Race!”, although it’s not as impossible to keep up with the first rider as he suggests, though it is difficult). but despite what it may look like on paper (or computer screen, as the case may be), it’s actually quite a fun little game. the game gets compared to other classic top-down racers such as r.c. pro-am. i haven’t played any of those (yet), so i can’t offer up any comparisons, but this game is appealing in many ways. there are only two powerups, a dolphin and an octopus, both of which provide useful boosts. there’s a turbo meter that recharges over time, and a number of hazards on the course including whirlpools, jump ramps, and rapids. the water mechanics are surprisingly believable. there isn’t any background music during the race, but it isn’t missed. there’s also a slalom mode that i found pretty useless, and once you beat the three racing challenges you’ll be disheartened to see that you’re confronted with an additional mode that requires you to beat all three again but with harder opponents. at the higher levels you definitely have to be fairly aggressive about pushing your opponents out of the way, which sometimes requires some AI memorization, which can be annoying. all in all though this was a surprisingly fun title and has me interested in playing its follow-up as well as other top-down racers.